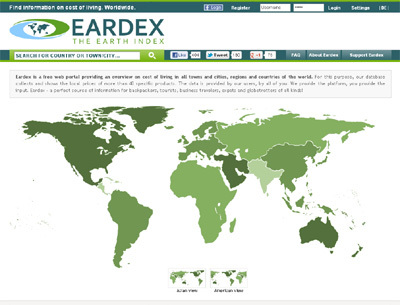 Eardex is a free website to compare cost of living worldwide. It works like a wiki for prices in all the towns and cities, regions and countries of the world. A perfect source of information for backpackers, tourists, business travelers, expats and globetrotters of all kinds! – Local prices of more than 45 products such as Big Mac, hotel, eating out, food items, public transport etc.